This option in Windows-10 is good if you want to restore default Windows 10 settings or if you are having problems on Windows 10! Dissatisfied with Windows 10? Do you want to install Windows 7 or another Linux or Apples operating system? You don't need do a clean installation or a custom installation of Windows 10! Here is an easy way to restore your windows, to make it great again. 1.) ... Find and start the Recovery options in Windows 10! 2.) ... What should I consider at Recovery in Windows? See also: ► How to create System Restore Point in Windows-10? 1.) Find and start the Recovery options in Windows 10! (Image-1) Reinstalling Windows 10 or reset! (Image-2) Choose reinstall options for Windows 10! 2.) What should I consider at Recovery in Windows? For all cases for example system crash, backup any files and settings you want to keep so that you can restore them after the installation. See also: ► Windows 10 "System Recovery" + cmd features! 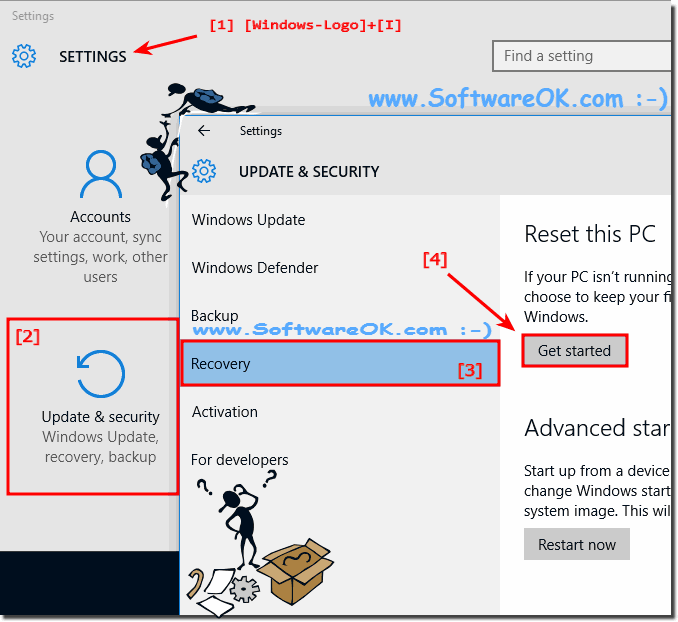 Windows-10 - FAQ-123: How to find Recovery options in Windows 10 / Home and Pro (reset, clear)? How do I prevent viruses on Windows 10 Home and Pro?